Cozy up this winter with the always-inspiring Artful Blogging. Both well-known bloggers and up-and-coming talents recount their journey into the world of artful blogging, sharing both their successes and their struggles. Learn how blogging has transformed the lives of artists all over the world. 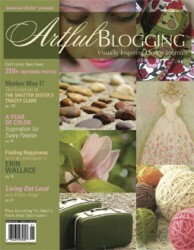 Whether you are an experienced blogger or a complete newcomer, Artful Blogging is a must-have resource that shares tips on blogging etiquette, tips for taking great photographs, and inside information from all of the hottest blogging platforms. Pick up a copy today and be prepared to take your blogging to the next level!